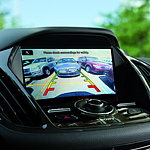 Ford Co-Pilot360 is an ahead-of-trend suite of driver-assist technologies. The technologies protect drivers, passengers and pedestrians from less than vigilant drivers, congested roads and increasing numbers of on-road distractions. We here at Dokmo Ford endorse Ford Co-Pilot360 wholeheartedly. Here are two reasons why. Automatic Emergency Brakes (AEB) is a last but wonderful way to ensure collision prevention. It starts with pre-collision assist and pedestrian detection, two features that result in alert sounds and warning flashes when a vehicle or pedestrian crosses in front of an advancing Ford vehicle. If the driver fails to respond to the alert sounds and warning flashes, the AEB system deploys. The Blind Spot Information System (BLIS) goes hand-in-hand with Cross Traffic Alert. BLIS refers to a radar that detects vehicles in your blind spot as well as pedestrians who cross behind you as you back out of a parking spot. The latter saves you from mowing someone down. The former helps you make wiser, safer decisions about merging and changing lanes. Ford Co-Pilot360 is slated to be standard on 90 percent of new Ford models by late 2019.